Minister Baldwin used her visit to follow up on British Prime Minister Theresa May’s recent visit to Africa, during which she announced new packages of support for Somalia, to help progress a comprehensive approach to Somalia’s long-term security, stability and resilience. The UK is one of the top three international donors to Somalia. 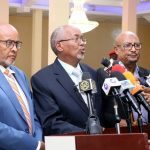 In Mogadishu, Minister Baldwin met with Prime Minister Hassan Ali Khaire, commending the government on the strides taken to progress political and economic reform. The Minister reiterated the UK’s commitment to supporting Somalia, and emphasised the importance of sustaining and building on achievements to date. The visit came one week after the Minister co-chaired a session on Somalia’s security during the UN General Assembly meeting in New York. During a tour of a UK funded police training facility in Mogadishu she witnessed how the UK is building capacity within Somalia’s own security forces, in addition to leading calls within the international community to increase support to AMISOM. 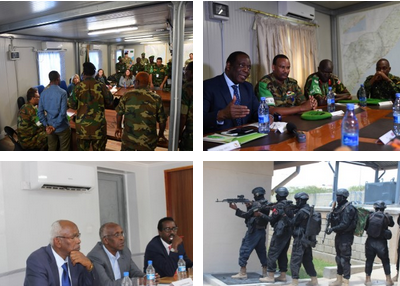 Minister Baldwin also met with AMISOM troops and Somali officers, praising them for their efforts fighting against Al Shabaab to restore stability. In meetings with international partners involved in humanitarian and resilience programming in Somalia, the Minister reaffirmed the UK’s commitment to remain at the forefront of the humanitarian response including stepping up and focusing on providing durable solutions that take the realities of rapid urbanisation, demographic shifts and climate change into account. The Minister recalled the recent announcement by the British Prime Minister, of over £60 million from the UK to support vulnerable Somali communities to cope with and recover more quickly from conflict and climate extremes. In the longer-term, this work will contribute to a reduction in conflict, fragility and regional population displacement in Somalia by reducing vulnerability and competition for scarce resources. On the second day of her visit, Minister Baldwin visited Somaliland where she met with President Muse Bihi, reiterating UK support for economic development, job creation and long-term reform. The Minister also saw how UKaid is making a difference to the lives of local people when she visited a UK-funded mother and child nutrition centre, which is helping children suffering from severe acute malnutrition. 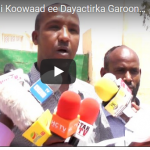 In both Mogadishu and Hargeisa, the Minister engaged with business representatives and entrepreneurs to discuss investment into Somalia, as a way of delivering economic recovery and long-term growth.